I Recently, have had several people ask how I go about photographing my work. I have to say I am using my third camera in the course of my business and every camera has required a different set up to get good photos. So, as with most things, trial and error is the best way to figure out what your best set up is. The first thing I have always had is something to block out shadows. 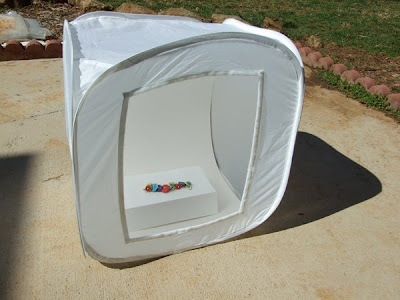 I used to tape vellum across the front of my lamps, now I have a light tent. These are great, I use mine almost everyday. See the photo above. In the past I have used daylight bulbs or tungsten bulbs. Make sure that you set the lighting type on your camera if you have one. My last camera had a tungsten setting and I used those bulbs and I got great shots. My new camera doesn't have that option, therefore it was back to experimenting. I found the sun to be my best lighting. I live in Georgia, where there is currently a drought. So the odds of having a sunny day are pretty good. You might have to save up all you photography until you have good weather. I also like to shoot around noon. The sun is overhead and it seems to help. If you need to use lights instead, place one on each side of the tent. My camera also has a macro and a super macro setting, which is great for beads. I almost always shoot my work on a white background. This makes for easier editing. After shooting the photograph on macro, I use Photoshop Elements to edit. It has color balance and other editing features to help with brightness and contrast. The camera I am currently using is a Fuji finepix 600. It's a couple of years old and they have different models now. My camera before this one was a Cannon Elph. I liked them both. But like I said before every camera is a little different so you'll just need to play around with what works best. Above is a photo of my set up.